Nokia’s HERE Maps which has been available for all Windows Phone devices and has been exclusive to Nokia’s Windows 8.1 RT tablet, the Lumia 2520 will be now coming to all the Windows 8.1 devices including Windows RT devices. HERE Maps will be available for all the devices for free. It will also work with mouse and a keyboard so all Windows 8.1 PC users need not worry. You’ll be able to enjoy features such as high-resolution satellite images, speedy map loading, and search history. HERE Maps will be available for North American and European users starting today while the rest of the world should get it soon. 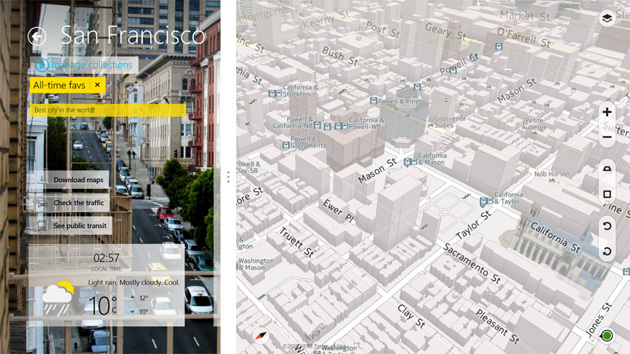 We have been a fan of Nokia’s mapping solution, Here Maps on Windows Phone, thanks to some great features it brings such as the ability of offline navigation. So, it’s nice to see the app coming for all Windows 8.1 devices.